One of the first things that I needed to figure out when I started training and learning about #Gsuite is WHAT is the difference between extensions, apps, and add-ons? At the #GAFESummit, thanks to the #EdTechTeach, I learned to distinguish between them and found some amazing new tools and toys. 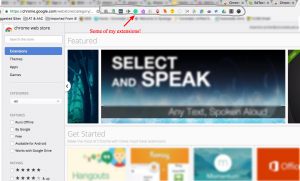 Chrome Extensions – Best thing since sliced bread!!! Extensions are essentially small programs that alter the functionality of your chrome browser. But this just seems like such a basic definition for such big actions. 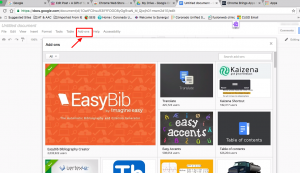 Many chrome extensions work in both Google Chrome and in Google Drive (depending on what they are created to do). The picture above shows some of my chrome extensions. “Awesome Screenshot” that allows me to take screenshots of what I am working on (I used for the picture above). I also have this extension called tab scissors that allows you to split up the tabs into different a browser window…Ok, so funny story… While writing this I tried this extension out. Now I am trying to figure out how to get my browser tabs all back into one browser bar. NO LAUGHING! I might take this extension off! EasyBib – I soooooo wish I had this back during my graduate programs! Funny side note…I also somehow got rid of my search bar on chrome. So extensions can be fun, but take the time to read instructions and pay attention to the changes you have made. I was messing around with so many extensions that it took me a bit to realize what I did. This goes back to my post about having enough knowledge to make me truly dangerous! Add-ons are tools created by third-party developers. They are available for docs, sheets, and forms. You can get add-ons while in docs, sheets, or forms pages. EasyBib is a must have add-on. It is an automatic bibliography and citation generator. 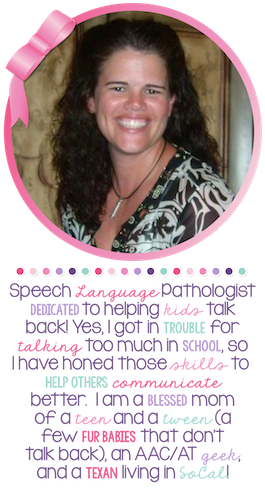 There are doc tools, tools for adding math equations, and so much more! Apps are programs that are created and can be run on any platform that has chrome. There are photo editors, microsoft office applications, music creation, and so much more!